Mail is a very useful type of communication in RIFT. 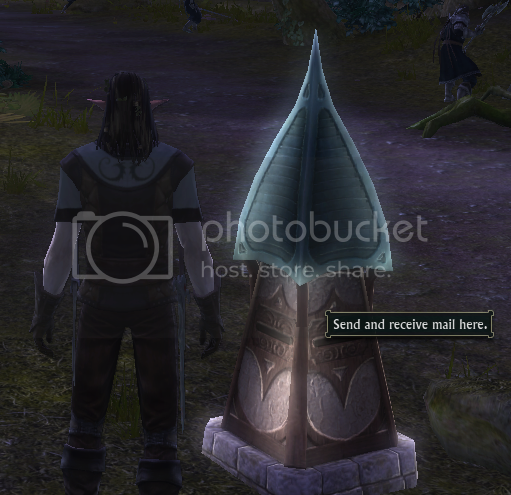 Mailboxes can be found in most central hubs in each zone of RIFT. You can also track mailboxes on your minimap. You do this by clicking on the tracking icon on the left side of your minimap and then clicking the box next to "Mailboxes." Once done, any mailbox within the area will appear as a closed envelope on your minimap. Approach and right-click any mailbox. An interface titled "MAIL" will appear; click on the "send" tab at the top. Enter the name of the player you want to send mail to and the subject of the mail. Enter the body of your message in the large field below the subject. If you want to attach an item, drag it to one of the boxes near the bottom of the interface. To Send Money, or to require Cash on Delivery (C.O.D. ), select either option and enter an amount in the field below. Once everything is completed, hit "Send" at the bottom and the mail will enter the system and be sent to the other player shortly. When you have new mail, an envelope will appear below your mini-map. An interface titled "MAIL" will appear; click on the "inbox" tab at the top. Your mail is listed here from newest to oldest; click on the mail you want to open . When you click on the mail, a new interface will open with multiple options. If an item is attached to the mail, retrieve it by clicking on the item. The mail will be returned to the original player in 30 days, if not deleted or returned sooner. Once it is returned to the original player they will have it for 30 days before it is permanently deleted, the mail will only bounce back once. The Auction House uses the mail system to facilitate most transactions. Mail is also used for simple or complex social interactions not involving money or items. Mail can also be sent to players by scripted events from NPCs in order to immerse players further into the world of RIFT. Mail can also be used to inform players of changes or issues within RIFT. Note: Customer Support is unable to assist with lost or incorrectly sent mail.